The safest and easiest way to remove tattoos! The process starts by using Photo Acoustic Technology which safely penetrates the skin and targets each tattoo ink color with specific wavelengths, causing tattoos to gradually fade over the course of 5 to 15 sessions. With today’s advancements in technology and technique, laser tattoo removal has become a far safer and easier method to remove your unwanted tattoos. We use lasers that are specifically designed to safely penetrate the skin and target each ink colour your tattoo contains. The lasers we use have 4 wavelengths meaning we can target blue, black, red, orange, purple, and even difficult colours such as green and sky blue. 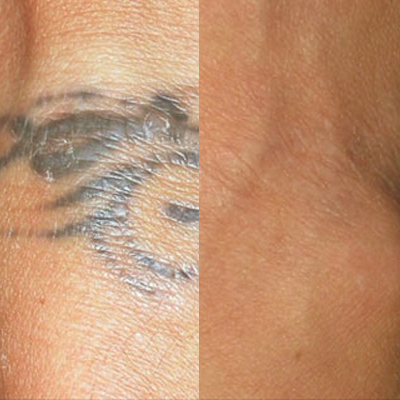 Gradually, your tattoo will fade in 5-15 treatments and you’ll forget it was even there! We’ll be using the most advanced laser systems available to safely remove your tattoo as effectively, efficiently, and comfortably as possible. While the laser is in use the targeted ink will be broken down through gentle vibrations that feel similar to small snaps of rubber bands followed by a light warm sensation. After the first treatment, your skin may be temporarily whitened. As treatments continue, the ink will be broken down and your lymphatic system will naturally eliminate the ink, returning your skin to its natural colour. The colours contained in your tattoo will determine how many treatments will be necessary. If you need more information or want to book a consultation, please contact us via phone at 604.542.0422 or via the contact page.